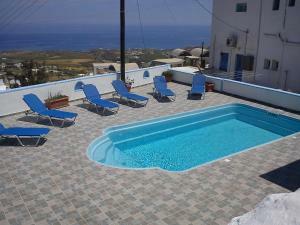 The Stella Nomikou Apartments is located just 5 minutes walk from the village center of Firostefani. It offers air-conditioned accommodation with a furnished balcony overlooking the Aegean Sea. This studio has a furnished balcony overlooking the Aegean Sea. It includes a kitchenette with kitchenware and a stove. There is also an iron available upon request. This studio has a furnished balcony overlooking the Aegean Sea. It includes a kitchenette with kitchenware and a stove. There is also an iron available upon request. The cleaning service is carried out daily. Towels and bed linen are changed every 2 days. This room has a furnished balcony overlooking the Aegean Sea.